There are a lot of things to consider before investing in solar. Here’s exactly what you should know. So, you’re going solar. It's a big decision, but you'll be happy you did it. Over the long term, the average 20-year savings for Americans who make the move to solar is projected to be over $20,000. That's some serious cash. Plus, you can feel good about supporting a carbon-free resource. It's a pretty big deal all around. But there are many things to consider before making the leap. Obviously, price does matter. Any installation company that presents you with a radically lower bid compared to others should make you suspicious. Experienced installers know the costs involved to install your system correctly. Newer installation companies may come in at a low bid because they are either not aware of the true costs of doing it right, or they are so new that they really, really want the business. It’s also good to be aware that many reputable installation companies may not repair another company’s mistakes for you -- and so if installed incorrectly the first time, you'll most likely have to pay to have the system completely removed and any damage repaired, prior to incurring the cost of an entirely new install. You’ll want to make sure you ask the right questions upfront. Doing your due diligence before the install ensures you won’t have to worry about inferior workmanship, leaks, or other easily avoidable mistakes down the road. It reminds me of something my father always said: “Do it all the way, or don’t do it at all.” Words to live by. 1. How long have you been in business? How much solar has your company installed to date? Personally, I'd only go with a company that has been actively installing for at least three years (the longer, the better, really). 2. Are you NABCEP Certified (North American Board of Certified Energy Practitioners)? Ask for proof. 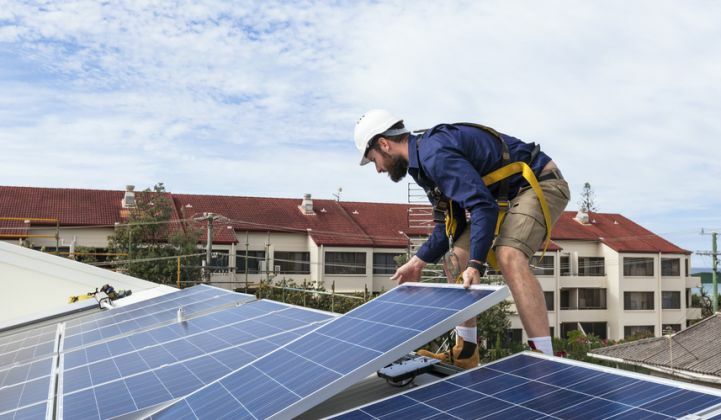 This is a voluntary certification that gives PV installation professionals additional experience and knowledge that will distinguish them from their competitors. This is a supplemental accreditation to state licensing requirements, and while it doesn't replace those requirements, it does add to the installer's credentials, giving them a leg up in terms of expertise. 3. Are you licensed and insured as a solar installer or electrician in my state? Ask to see the installer's license and proof of insurance. You don’t want to hire someone and then see a vehicle with a company logo you don’t recognize show up in your driveway, leaving you scratching your head and wondering what’s going on. It’s OK if your installer subcontracts -- many companies use a network of installers across various jobs -- just be sure the subcontractor holds the proper accreditations. 5. What are the electrical codes in this area, and how do you adhere to them? This varies by state. Know your codes beforehand and make sure the installer knows them all as well. 6. What are the names of the module and inverter manufacturers whose products you use? What are their warranties? Get a run-down of what will be used and then look the companies up online to make sure they're reputable. Check out reviews and/or testimonials. 7. Can we go over the racking, mounts and fasteners that will be used? Same as above. Structural attachments between the roof and the modules are extremely crucial elements of your installation. Unhappy customers are sure to tell you about their experience. You should also go to the company’s website and look for testimonials, as well as research the company online for any related reviews. It also wouldn’t hurt to ask for one or two local addresses you could drive by to see the installs for yourself, in person. 9. Can I see some photos of systems you've installed that are similar to the ones you’ll be installing on my house? Chances are, if they can’t show you any photos, they haven’t done much in the way of actual work. Going solar should be a great experience, not a headache. Doing your homework upfront will give you something money can’t buy: peace of mind. Ask these questions, and you'll be well on your way to a good solar experience.